For the whole world to develop higher awareness or consciousness, it simply comes down to the fact that we need to understand ourselves. We need to realise that we are one planet, one organism. Science for years now recognises an organism at war with itself is doomed. Humanity has turned against itself in so many ways; from pointless wars, misguided governments, to religion* and ignorance towards science. The world is being held back by so many different directions. That being said, today our world is still progressing and crawling forward despite so much ignorance. There are people that create companies or organisations to have a greater impact on the world such as; SpaceX/Tesla, Google, Alibaba, Roboterra and in fact there’s a whole list of companies you can see that are trying to change the world (I personally don’t agree with this whole list). This however highlights the significant impact that companies have on this planet, and in turn it will most likely be them to affect our future, not the government’s. Entrepreneurs and companies are evolving with technology and we are creating our own ecosystem. Where this system is controlling so much of the world’s economics we’re encouraging the government to follow us for the betterment of human progression. You don’t have to create a company if you want to have an impact. There are some individuals impacting the world just as much through their own means; Nelson Mandela, Albert Einstein, Mahatma Gandhi, Karl Marx, Carl Sagan and countless more. We just have to hope that all this good, all this progression, is faster than all negativity holding us back because that is what will destroy us. 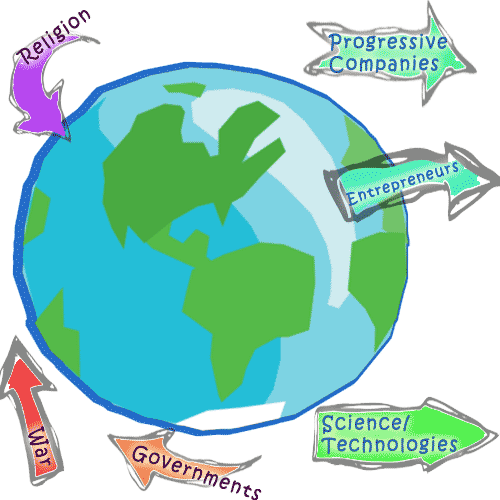 World progress, ideas that are holding humanity back. and some that are moving it forward. Our world is always run by the older generation (Average age of President 55 and Prime minister 53). This is not always a bad thing. However, recently the growth of technology, the change of our civilisation and the impact we have on the planet today are so drastically different and influential we as a species need to accept this development. We need to become more aware of it and stop all the old fashioned thinking, prehistoric beliefs and resistance to change. We need countries and governments to better understand their actions in a global scale. Embrace new progression and care less about national politics, so they can implement progressive world strategies. If you think over the last 50,000 years the total of Earth’s population was 107 billion. In the last half decade we have had 7 billion. So in 0.01% of time we have 6.5% of the entire human existence. In sheer numbers we have an enormous effect on the earth, and when you bring technology into that we obviously have a worldwide impact. So we better start acting like 200 thousand years of evolution… The dinosaurs didn’t, look what happened to them. *Will discuss this further in future blog. This entry was posted in Amateur Pioneers Logic and tagged life, logic.